Softening, filtration, decarbonation, reactive dosing, neutralization, reverse osmosis and demineralization. PYROCRYSTAL S.r.l. 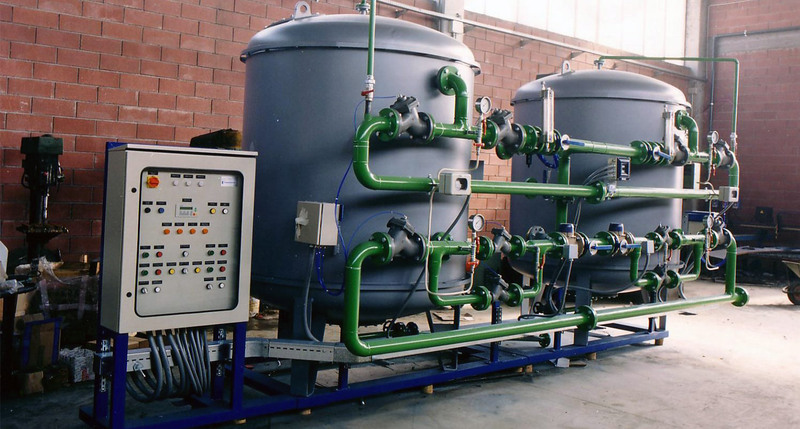 offers process design, engineering and installation on a turnkey basis of complete plants of DEMINERALIZATION, SOFTENING, CHEMICAL DOSING, QUARTZ/ACTIVE CARBONS FILTERING, REVERSE OSMOSIS, essentially for the industrial sector with particular attention, since many years, to the COGENERATION PROCESS, obliged target for the early future. PYROCRYSTAL S.r.l. projects, manufactures and install on a turnkey basis, ionic exchange demineralization plants on one or more lines. If necessary could be also installed pre-treatment plants such as dual-media filters quartz-anthracite, or active carbons filters. For the final polishing are generally employed mixed-bed units. PYROCRYSTAL S.r.l. projects, manufactures and installs on a turnkey basis softening plants on one or more lines with time and/or volume regeneration. Softening is a process of partial removal of solids solved into e solution, to reduce its hardness. This process could be considered a particular kind of demineralization (for more information see the related page). PYROCRYSTAL S.r.l. projects, manufactures and install on a turnkey basis sand filtering plants, dual media and active carbons. Final aim of filtering is to with-hold suspended substances or to eliminate water turbidity, in particular when it could alter the correct operation of a ionic exchange unit. PYROCRYSTAL S.r.l. 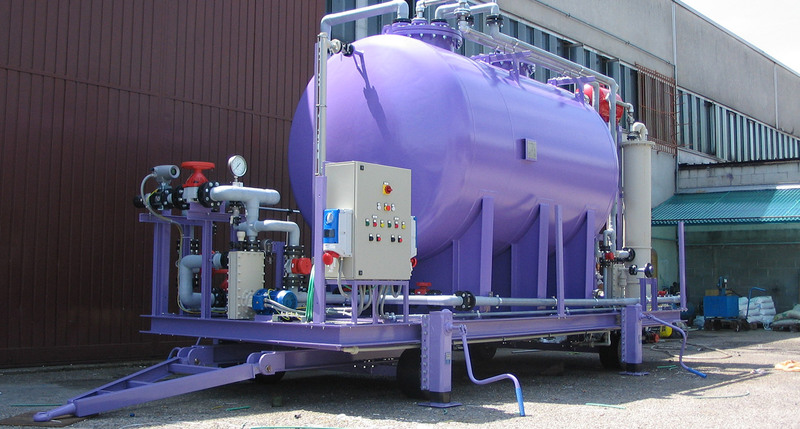 projects, manufactures and install on a turnkey basis plants of chemical dosing finalized to many applications. Our plants are assembled on painted carbon steel or stainless steel skids, complete of transfer pumps, stock tanks (in plastic, stainless steel or glass-reinforced plastic), mixers for reagent mixing, control switch boards. PYROCRYSTAL S.r.l. 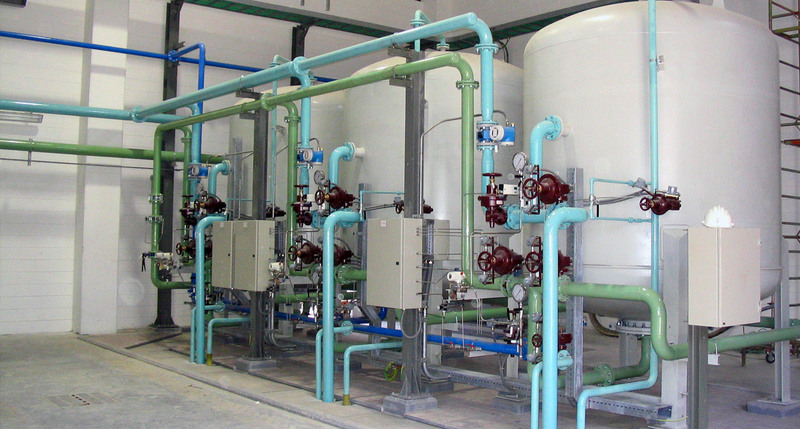 projects, manufactures and install on a turnkey basis reverse osmosis plants complete of chemical/physical pre-treatment. Our plants are assembled on painted carbon steel skids or stainless steel ones, complete of piping and stainless steel connections, high-pressure pumps and control switch boards. PYROCRYSTAL S.r.l. takes advantage of highly specialized staff to grant to the customers maximum efficiency of technical assistance both help-desk and on-site. We also offer services of start-up, maintenance and conduction of our plants and for plants manufactured from other companies either on the Italian territory and at international level. preservation of the environment in relation of the enforced norms.